The D800 went back, so I won’t be able to do a direct A-B comparison, but what I will do is post an update as I shoot with it more. I’ll also try to find a matched image to shoot (both under ideal conditions) so we can take a look at the differences. Initial impressions: acuity is better, but ever so slightly. It seems to remove that ‘layer of fog’ from some lenses, though. Annoyingly, you can’t save settings on a D800 then transfer them to a D800E; apparently the firmware is different, too. Everything else is the same. The question you’ve been wondering about is AF: yes, it’s a hell of a lot better. Not 100% perfect on the left side, but close enough to LV that I’m now wondering if my copy of the 24 is a bit off and the other bodies just weren’t high enough resolution to notice it. The 85/1.4G is noticeably better than on the D800; no explanation why. I haven’t used the other lenses yet, so I can’t comment. But I do have a watch shoot coming up for which I’ll use the 85 PCE, so that should be interesting. Quick update at 8pm: I forgot to mention earlier that I also had a chance to play with the new AFS 28/1.8 G at Nikon; it was a prototype so they didn’t let me take it away for a more extensive evaluation, and I wasn’t allowed to keep any images. First impressions are positive; it’s sharp wide open, bitingly so by f2.8, consistent across the frame, focuses fast and positively, and is surprisingly light. However, the problem for me is that it simply lacks character; I can’t put my finger on why but I suspect it’s to do with Nikon’s preference for macro contrast over micro-contrast. The Zeiss 2/28 Distagon may not be as perfect on a test chart, but it certainly has much more personality – and remains my preference in this focal length. I suspect also that it has a much higher T stop than the Nikon. I hope Nikon gets the D800(E)’s AF issues sorted out soon. It’s a pity not to be able to use a lens such as the 85 f/1.4 on this camera. Btw, last saturday I was talking to one of the vendors at a (well-known) camera store in Amsterdam and discussing the AF issues of these cameras and the low performance of some of Nikon’s high-end lenses (24 f/1.4 and 85 f/1.4 in particular) he gave me an explanation as to why this happens that made me think twice, and for which I still don’t have the final answer. He said that the reason these cameras perform poorly with such lenses (large maximum apertures) is due to the fact that the sensor is receiving too much light from the lens (specially from high-end lenses with very good optics) and can’t cope with the resolution outputted by these lenses and thus fails to AF properly (besides the misalignment issues). I’ve been doing some research to see if this claim has some theoretical foundation but I can’t find anything yet. What do you guys think? is this possible? To me it makes sense, although, I’d prefer to have a scientific explanation for this rather than just conjectures and common sense. The 85/1.4 G does a lot better on the D800E for some reason; don’t know if it’s because the focusing on my body is also a lot better, or because of the interference between the AA filter and the optical formula. The 24/1.4 is actually very sharp if you can focus it properly! I don’t think what he said makes sense; too much light and small pixel pitches might cause blooming or haloes, but the dynamic range of the D800 sensor is so good this is unlikely to happen. I think it’s more likely that fast lenses are much harder to design with high resolution and a high degree of correction, and the high resolving power of the D800/E shows up every compromise made. Congratulate on your D800E, I still waiting for mine and really don’t know when is my turn. 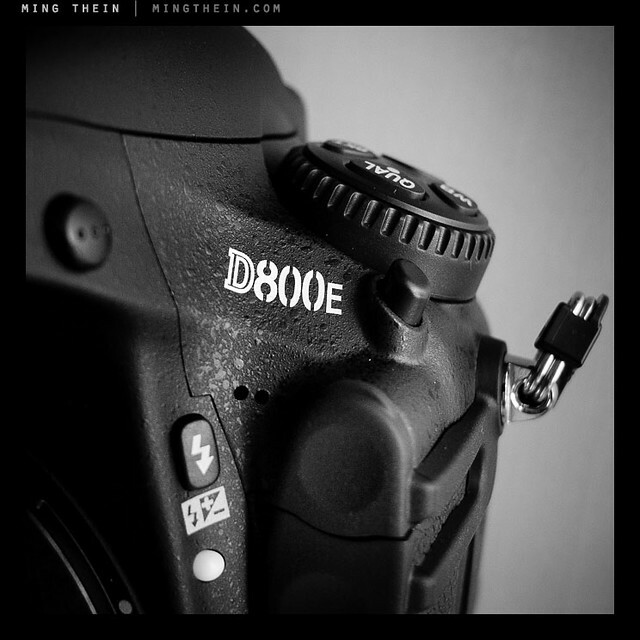 BTW, does it mean that D800E don’t have the issue like the issue happened on D800? Maybe I should wait for sometime after all the problems been fixed? Thanks – there are still some minor issues present on my body, but not as bad as the original D800. I’d say it’s useable for now. Thanks Ming Thein. Based on what you had mentioned, it seems like this is a hardware issue and no firmware/software can fix this 😦 Looks like I have to visit NSC some time later too. I’m afraid so. But there are a lot of positive reports, so I wouldn’t worry too much. Am so looking forward to your insights on the 800E. Hope you get to try the 14-24. I’m wondering if it will.perform better than the standard D800. Cheers! I imagine it would, but I don’t plan to buy a 14-24 again – just too wide for me. I don’t really have a use for it. Glad to know that you got the D800E after your wait… has been following your post on the D800 camera since beginning of April. Got my D800E Serial 8001XX1 couple of days back. Did some random testing. No calibration done. 50mm f1.4G & 85mm f1.4G – sharp both wide open and stop @ 5.6, left, centre, right focus points, 16-35mm VR – sharp across the zoom range for left, centre, right focus points. Culprit is 24mm f1.4G – centre and right sharp but left a tad softer; tested wide open. With LV, its all good. I am really interested in your results for your 24mm f1.4G with your copy of D800E. Apart from that – great camera 🙂 Many thanks in advance. Thanks Chris. My D800E is a LOT better than the D800, but not 100% perfect. There is a very, very slight difference left side between LV and AF on the 24/1.4 wide open, but it’s acceptable (I think). I might send it in later at some point, but I’ve wasted enough time on this issue for now – it’s time to get back to work! It’s in the plan, but this month looks hugely busy. Will do what I can!